Suspect is a white male, older, approx. 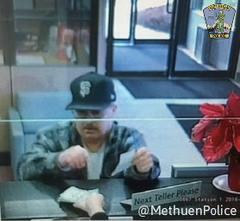 5'8", 170 lbs, wearing a white shirt, grey plaid jacket, jeans, dark sneakers and a black Giants baseball hat. Possible suspect vehicle is a blue Dodge intrepid (no plate) last seen on Rt. 213 heading towards Rt. 93. Suspect passed a note, no weapon shown.